National Energy Services Reunited Corporation (NESR), a leading provider of integrated energy services in the Middle East and North Africa (Mena) region, said it has signed a land lease agreement with Saudi Aramco to build a state-of-the-art operating facility in the newly launched King Salman Energy Park (Spark). A major player in the regional oilfield services, NESR is headquartered in Houston, US. The company started out as special-purpose acquisition corporation designed to invest in the oilfield services space globally in May last year. In November, NESR announced the acquisition of two most prominent oilfield services companies in the Middle East and North Africa (Mena) region: Gulf Energy SAOC (GES) and National Petroleum Services (NPS). The formation of NESR as an operating entity was completed in June this year, after the transactions were approved by Securities and Exchange Commission in United States and NESR shareholders respectively. The recently-launhed Spark is a 50-sq-km energy city which will position Saudi Arabia as a global energy, industrial and technology hub. Saudi Aramco will be in charge of the development, operation, management and maintenance of the project's infrastructure in partnership with the Saudi Authority for Industrial Cities and Technology Zones (Modon). 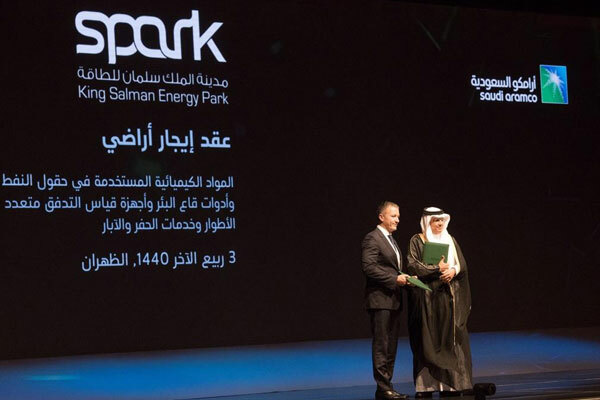 Spark's role in enabling localisation within the kingdom's energy supply chain aligns with the strategic goals of Saudi Aramco's In-Kingdom Total Value Add (IKTVA) program and affirms the kingdom's commitment to Vision 2030 by serving as an economic catalyst and advancing Saudi Arabia's strong position in the global energy sector. Dr Mohammed Y Al Qahtani, the senior vice-president for upstream, Saudi Aramco, said: ''Spark will emerge as a key enabler for Saudi Aramco's IKTVA programme which has a mission to raise local content to 70 per cent by 2021." "Presently, the kingdom's requirement for energy-related industries is growing and requires dedicated industrial development focused on the energy sector and Spark will provide for the development of a world-class energy industry hub to support the same,'' stated the top official. When operational, Spark is estimated to contribute more than $6 billion to the kingdom's GDP annually and create up to 100,000 direct and indirect jobs. NESR chairman and CEO Sherif Foda said: "We are very honoured to be given the opportunity by Saudi Aramco to be part of this endeavour at its inception. NESR has considerable experience in local manufacturing and indigenizing the supply chain which is already being implemented in the kingdom."